Like many things, some people are looking for natural alternatives to thyroid hormone replacement or anti-thyroid treatment. 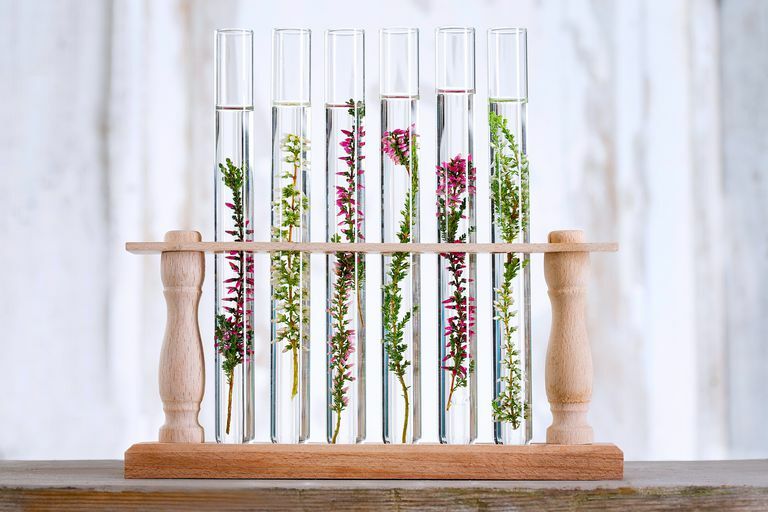 While there are no herbs that have thyroid hormone in them, there have been studies evaluating herbs as alternatives or add-ons to thyroid medication. For the most part, if you do not have a nutritional deficiency, herbs and supplements will not resolve your thyroid condition—and some may cause serious health problems. However, some herbal supplements may help optimize your thyroid function by interacting with the hormones that are already present in your body. If you are looking into herbal treatments, keep in mind that the effects they have on one type of thyroid disease are not likely to be the same for all types of thyroid disease. Chamomile, sage, and mountain tea have all been associated with a decrease in benign and malignant thyroid disease, and this effect appears to be the strongest for chamomile tea. In one study, consuming between two to six cups of these types of herbal tea per week was associated with a reduced incidence of thyroid disease. The reason for this association is not clear, however. Green tea, interestingly, has been associated with a lower incidence of thyroid disease for some people, but a higher incidence of thyroid disease in others. Subclinical hypothyroidism is characterized by low thyroid hormones levels without symptoms. Ashwagandha, also referred to as Withania somnifera and Indian ginseng, is derived from a nightshade plant. It is a traditional medicine used in Ayurveda practice that comes in a capsule and powder form. At an average dose of 600 mg per day, it has been shown to reduce thyroid hormone abnormalities in subclinical hypothyroidism in a few small human studies. It is important to note that ashwagandha can trigger a severe form of hyperthyroidism known as thyrotoxicosis. Hyperthyroidism is excessive thyroid hormone activity. Lycopus europaeus, also known as bugleweed, is an herb that has been shown to help reduce the symptoms of mild hyperthyroidism in human studies. It may also reduce the symptoms of Graves' disease, an autoimmune type of hyperthyroidism. Bugleweed is believed to act against the antibodies that cause Graves' disease, but it is not clear why it may reduce symptoms of hyperthyroidism even if you do not have this particular type. It comes as a liquid and a pill, and while it has been well tolerated in human studies, the ideal dose is not established. In addition, a combination of Yingliu mixture and methimazole has been used for the treatment of Graves' disease in China. Methimazole is an antithyroid medication, and Yingliu mixture is a preparation of oysters, white mustard seed, and a variety of herbs and plants. A number of studies that used a Yingliu mixture prepared in a laboratory have been carried out in China. Results consistently showed that clinical symptoms and thyroid tests were better with the combination than with the methimazole alone. There are many types of thyroid tumors, and some can be quite aggressive, requiring surgery, chemotherapy, and radiation treatment. Fucoidan, which is isolated from the Fucus vesiculosus seaweed plant, has been shown to help control the growth of thyroid tumor cells in a laboratory setting. It is not clear whether this will work in preventing thyroid tumor growth in humans. A goiter is an enlarged thyroid gland. It can be a sign of hyperthyroidism, hyperthyroidism, or a thyroid tumor. Several herbs used to treat thyroid disease in traditional Chinese medicine, including Thallus Sargassi Pallidi (HZ) and Radix Glycyrrhizae (GC), contain Haizao Yuhu Decoction (HYD), an herb which has been shown to reduce the size of goiter in rat studies. Your body needs iodine, an essential mineral, to produce thyroid hormones. Those who are deficient may be advised to increase iodine through diet or supplementation. There are several types of iodine supplements, including a preparation described as "reduction of 131I," which is made of dried seaweed and other herbs and plants. While restoring too-low iodine levels is important to thyroid function, such deficiency is very uncommon in the United States and you must be careful about over-consuming iodine either inadvertently or with the best of intentions. Excessive levels of iodine can cause thyroid disease. They have also been shown to induce hypothyroidism in some people and hyperthyroidism in others. As such, it is best to approach taking iodine-containing herbs and supplements with caution and under the guidance of a healthcare professional. Iodine is an element found in seafood and dairy products and, in the United States, standard table salt and fortified foods. For that reason, it is rare for someone living in America to develop thyroid problems related to an iodine deficiency. Thyroid disease is a lifelong condition and the idea of herbal therapy can sound like a safe way to control your condition and your symptoms. At the current time, herbal remedies have only been found to be marginally effective in altering thyroid function. As you consider herbal treatments for any medical condition, including thyroid disease, be wary of claims that any product can "balance" your system. With thyroid disease, the effects of "too high or too low" are both problematic, and there is not a natural therapy that can simultaneously address both conditions. Eiling R1, Wieland V, Niestroj M. [Improvement of symptoms in mild hyperthyroidism with an extract of Lycopus europaeus (Thyreogutt® mono)]. Wien Med Wochenschr. 2013 Feb;163(3-4):95-101. doi: 10.1007/s10354-012-0167-z. Epub 2012 Dec 18. Riza E, Linos A, Petralias A, de Martinis L, Duntas L, Linos D. The effect of Greek herbal tea consumption on thyroid cancer: a case-control study. Eur J Public Health. 2015 Dec;25(6):1001-5. doi: 10.1093/eurpub/ckv063. Epub 2015 Apr 4. Sharma AK, Basu I, Singh S. Efficacy and Safety of Ashwagandha Root Extract in Subclinical Hypothyroid Patients: A Double-Blind, Randomized Placebo-Controlled Trial. J Altern Complement Med. 2018 Mar;24(3):243-248. doi: 10.1089/acm.2017.0183. Epub 2017 Aug 22. Shen HY, Li LZ, Xue KC, Hu DD, Gao YJ. Antitumor activity of fucoidan in anaplastic thyroid cancer via apoptosis and anti-angiogenesis. Mol Med Rep. 2017 May;15(5):2620-2624. doi: 10.3892/mmr.2017.6338. Epub 2017 Mar 16. Yang H, Cong Y, Wu T, et al. Clinical efficacy of Yingliu mixture combined with metimazole for treating diffuse goitre with hyperthyroidism and its impact on related cytokines. Pharm Biol. 2017 Dec;55(1):258-263. Zhang Y, Li Y, Mao X Thyroid hormone synthesis: a potential target of a Chinese herbal formula Haizao Yuhu Decoction acting on iodine-deficient goiter. Oncotarget. 2016 Aug 9;7(32):51699-51712. doi: 10.18632/oncotarget.10329.